Potage Crécy is simply a carrot soup. Even if it doesn't instantly bless you with amazing night vision, all those carrots will undoubtedly improve your health one way or another. 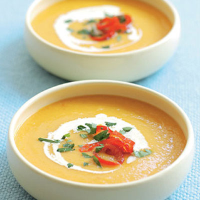 Carrot soup has long been a firm favourite for me: it tastes good, it's comforting, it's cheap. It is also open to all kinds of other flavours, such as that of Peppadew peppers. If you haven't tasted these little, almost spherical, preserved peppers before, then do so. They're superb with cheese or cold meats, and can also be stuffed with cream cheese and herbs, or fresh crab. Heat the oil in a large pan over a medium-low heat, add the onion, carrots and bouquet garni and sweat, covered, for 10 minutes. Add the rice and peppers and stir well. Add the stock, season with salt and pepper, bring to the boil, then reduce the heat and simmer for 10-15 minutes until the rice and carrots are tender. Cool slightly, remove the bouquet garni then liquidise. Add a little more stock if the soup is too thick for your taste, and stir in a squeeze of lemon juice. Check the seasoning. When ready to serve, reheat and ladle into warm bowls. Add a swirl of soured cream then top with torn coriander or parsley and sliced Peppadews. Tangy Peppadew and sweet carrot work nicely with a glass of dry sherry.